Fredrik Marine carries Marine PC’s professional grade waterproof LED computer monitor, the SL12 series. Its slim line aluminium bezel LCD bridge monitor has been specially made for maritime usage. Suitability for the rugged maritime environment is ensured as the aluminium casing and coated electronics does not allow corrosion to occur. Its ruggedness is further shown by the operating temperature range, -10 to 50 °C. 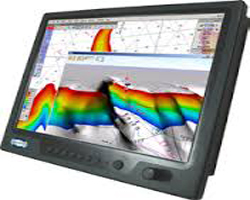 This IP65 maritime monitor comes in varying sizes (12.1”, 15”, 17”, 19”) and unlike other monitors in the market, there is no sunlight glare that makes the monitor hard to read. The LED backlight delivers up to 1000 nits of full sunlight readability, yet dims to ~1 nit for use on moonless night. The anti-reflective glass prevents fogging and reflection. Other than glare, viewing conditions can be further optimised with adjustable knobs for control over quality and brightness. Installation is easy – via a shock resistant adjustable ball mount, or ordered with the optional flush bezel. Connection will be done via a VGA output and a sealed 10 feet cable to reduce clutter on board. Although there are various sizes, the SL12 is smart enough to auto-scale any standard 4:3 input resolution to fit full screen. For a better user experience, you can opt to have a touch screen that can operate under wet conditions without fogging, a definite good-to-have for boaters. Common usage of the AWM2R includes primary display or repeater from a computer, chart plotter, blackbox radar, sounder and weather computer. The MPC-SL19 has been certified by Bureau Veritas to pass IEC60945 testing per IACS-E10 for use on IMO Approved vessels. MarinePC designs and manufactures high-quality electronic displays and computing products for use in marine environments. These computers are specifically configured and prepared for use in the toughest and most extreme environment for computers—that of a craft on water. The company has a vast customer base with users found throughout the Americas, Asia, and the European Union. Customers range from luxury yachts to commercial vessels and offshore units. Government clients include U.S. Navy, the U.S. Coast Guard, and Customs and Border Protection, as well as the navies of several other countries.